Like many 10-year-old boys, young Hayes Hutto has long dreamt of life as a football star. However, Hayes has also had some very difficult challenges to contend with while achieving his goals. At just 18 months he was diagnosed with cerebral palsy; a group of lifelong movement and coordination disorders which first arise during childhood. Hayes, from Georgia, has experienced motor ability issues throughout his life, and has to use a wheelchair for mobility. 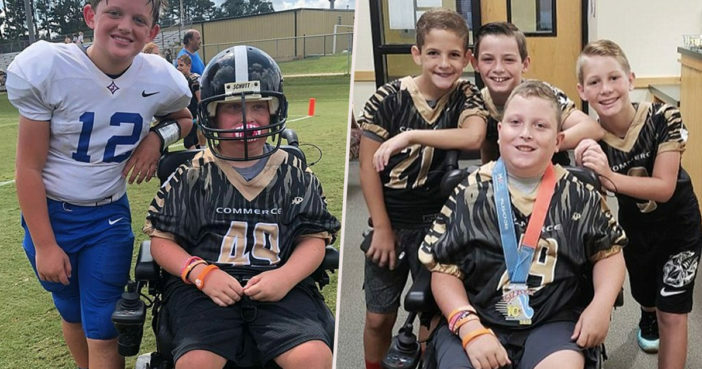 Hayes has shown a determination and passion for sports beyond his years despite his physical health; and has now scored his first ever touchdown. The touchdown happened during an important game where his middle school football team, the Commerce Tigers, played long-time rivals the Jefferson Dragons. On Saturday, September 8, Hayes went to cheer on the team with his parents, teachers Jon Hutto and Jodi Stephenson Hutto, and had no clue whatsoever he was about the become the star of the game. His first surprise came when he was honoured with leading the Commerce team from the tunnel at the beginning of the game. As Hayes watched from the sidelines, the team – which included his best friend Brody – handed him a Commerce football jersey and invited him to play. The quarterback chucked Hayes the ball and the crowd chanted ‘Hutt-o! Hutt-o’ as heroic Hayes headed 65 yards down the pitch, scoring his very first touchdown. Hayes’ proud mum Jodi shared plenty of footage of the remarkable touchdown through Facebook, describing it as ‘one of the most humbling moments in my life’. This is awesome! Love these sweet boys and their caring hearts! They are the ones that came up with this idea to surprise Hayes and make his dream come true. This simple gesture made a huge impact in Hayes’s and our families lives. A memory that we will carry forever! This post isn’t bout my boys or to get attention it’s bout making someone smile and showing love to a great young man…. We weren’t expecting for anything to happen other than being on the sideline with the team. Coach said he was going to try to put him in. It’s cool that both schools are huge rivals but were able to set that aside yesterday. Both stands were hollering and cheering. Hayes reportedly took the ball home as a memento, and has been understandably reluctant to part with it ever since. Hayes’ supportive family have set up a Facebook page called Hayes’s Walk which documents Hayes’ journey to walk. A couple years ago, we were able to get him a motorized wheelchair that has given him the freed to be just like all the other kids around him. His friends favorite part is to ride on the back of his wheelchair. Hayes is loved by everyone that meets him. He has a love of life like no other child I have ever met. It certainly sounds like Hayes has some great friends and family members by his side as he continues loving life and loving sport. Well done Hayes!